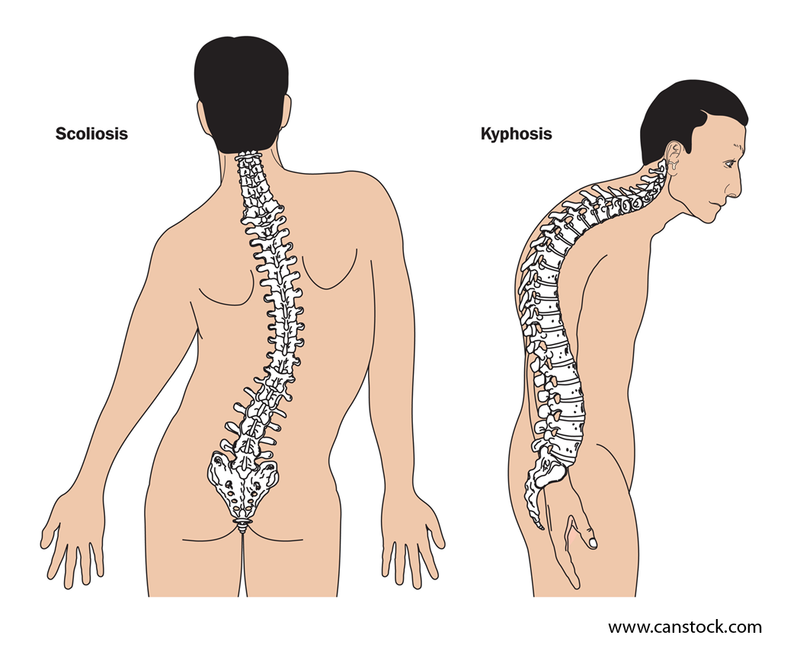 Scoliosis is a curving of the spine which bends sideways or away from the middle. While it may sometimes be caused by conditions such as cerebral palsy or muscular dystrophy, the cause of the most common form of scoliosis is still unknown. Congenital (present at birth) scoliosis is due to a problem with the formation of the spine bones (vertebrae) or fused ribs during development in the womb or in early life. Neuromuscular scoliosis is caused by problems such as poor muscle control or muscle weakness, or paralysis due to diseases such as cerebral palsy, muscular dystrophy, spinal bifida or polio. Idiopathic scoliosis has no known cause and is by far the most common form of scoliosis. Adolescent Idiopathic Scoliosis (AIS), which develops in young adults around the onset of puberty, represents approximately 80% of idiopathic scoliosis cases. Some people may be prone to spinal curvature. Most cases occur in girls. Curves generally worsen during growth spurts. Scoliosis in infants and young children are less common. Individuals with Marfan syndrome, a connective tissue disorder, frequently have scoliosis of varying severity. Other symptoms can include backache or low back pain and fatigue. There may be fatigue in the spine after extended standing or sitting. Pain will become persistent if there is irritation to the soft tissue and wear and tear on the spinal bones. An especially severe spinal curve can reduce the amount of space within the chest, making it difficult for the lungs to function properly. What are the Scoliosis Treatment Options? Most children with scoliosis have mild curves (usually less than 20 degrees), usually with no pain and probably do not require treatment other than regular checkups every four or six months to monitor the curvature of their spines. Spinal maturity: Is the patient's spine still growing? Potential for progression: Patients who have large curves prior to their adolescent growth spurts are more likely to experience progression. A doctor may recommend a back brace for a patient with moderate scoliosis, especially for a child whose bones are still growing. Wearing a brace won't cure scoliosis or reverse the curve, but it usually prevents further progression of the curve. Most braces are worn day and night, with the effectiveness increasing the more hours per day it is worn. Braces are discontinued when the bones stop growing, which typically occurs about two years after girls begin to menstruate and when boys need to shave daily. The choice of when to have surgery will vary. A child may need surgery before the bones of his skeleton stop growing if the spinal curve is severe or getting worse quickly. Curves of 40 degrees or greater usually require surgery. Scoliosis surgery, or spinal fusion, is intended to reduce the severity of the spinal curve and prevent it from getting worse. Spinal fusion surgery involves straightening the curve and fusing the bones in the curve together. The bones are held in place with one or more metal rods secured with hooks, screws or wires until the bones heal together. Sometimes surgery is done through an incision in the back, on the abdomen, or beneath the ribs. Scoliosis, mild, moderate or severe, can be a distressing physical, emotional and psychological life process for anyone to tolerate. When that person is a teenager – and chances are high that it will be – he or she is already being bombarded with physical, emotional and social changes. He or she may react with anger, insecurity, fear and lowered self-esteem. A strong peer support group can have a significant impact on a child or teen's acceptance of scoliosis and the bracing or surgical treatment that may be required. General kindness and acceptance by family and friends will also help in the process, as will organizations such as the National Scoliosis Foundation.